Numerous media outlets have are reporting that the GMO labeling efforts in Oregon and Colorado have both failed. Though while the Colorado initiative did in fact fail with only 34.29% support, the Oregon measure is actually still alive. 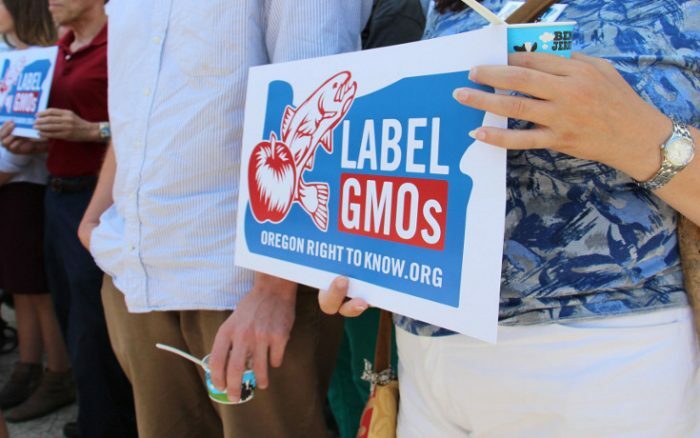 That’s right, through 13,000 contested votes and 15,000 uncounted, the GMO labeling measure in Oregon still has a chance. 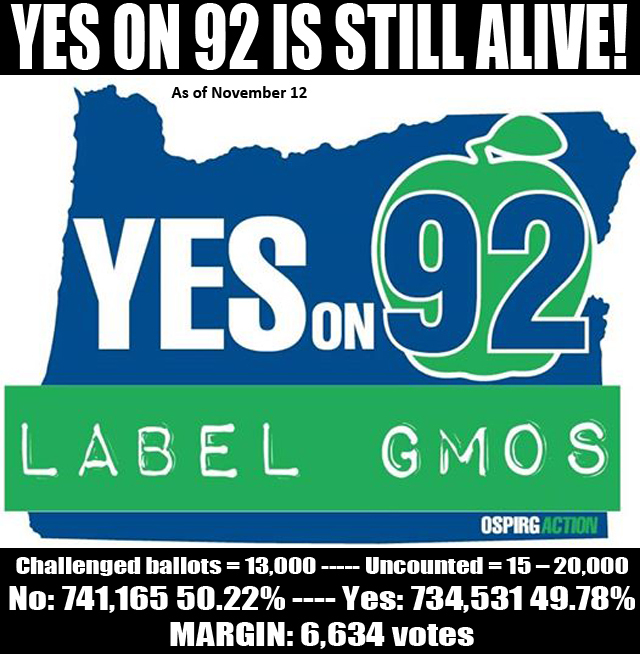 Oregon’s GMO labeling Measure 92 was originally reported defeated thanks to Monsanto’s onslaught of more than $22 million dollars in negative ads. But contrary to these reports, it isn’t quite over. Right now about 6,000 votes separate us from winning Yes on 92! Oregon Secretary of State’s office recently reported that that there were 13,000 contested ballots outstanding that we now have a chance to chase down to find out how the voter intended to vote. Monsanto may have spent 10’s of millions to shut down this GMO labeling measure as they have done for so many other GMO labeling bills, but as the biotech giant is learning – we are not making it easy for our food rights to be crushed. We may lose some battles, but we will not lose the war for our food freedom. That’s right, approximately 6,500 votes separate us from winning another key GMO labeling initiative in the US. We now have 4 days to capture the challenged ballots and hopefully call it a victory. On November 18th, all ballots will be certified. Contribute today through Food Democracy Now to help support the measure before it’s too late. Show Monsanto that even tens of million in advertising can’t sway us. There are only 7 hours left to use this tool to find out if you or your friends are among the 11,441 remaining challenged ballots- https://chase.votingwithfriends.org/. Over the past 12 hours, more than 6,000 people have used this app to find out if their vote had been rejected. This is the slimmest margin for a ballot measure in Oregon history- every vote should count! Challenged ballots must be resolved by 5 PM tomorrow, Tuesday Nov. 18., to be counted. The thiing that chaps my arse, is that people are so brainwashed to follow along the ad campaigns, the tv spots, the road signs, that they don’t even know what they want themselves! I am so sick of people being sheep! It doesn’t matter if it is gun control, GMO labelling, abortion, or the death penalty, people need to read both sides of ANY issue and make a decision based on their own personal beliefs not what is rammed down their throats! I wish for one day that people would stop and think what is important the them and their families and forget about shopping, renovating, playing the he said she said games they do, shut down facebook, put down the cell phone, turn off the tv, and really look at what is going on in the world. People do not even realize the power we have. We assume that you can’t fight the system, but we are the system! We have the power. Man it is so simple. Do we want to show walmart that we mean business about their mistreatment of employees? Stop shopping there! Go to Target. Want to show Monsanto and Sygenta we want the truth, stop buying their seeds! People…vote with your wallet because that is all they listen to! You can scream and shout, block roads, wave signs…it doesn’t matter! But walmart shares go down 10 percent becuase they lost 140 million this quarter…whoa, now they listen don’t they!! We have the power people use it!!!!!!! I don’t understand why people are not voting 100 percent on this issue. Regardless of whether or not GMO’s are safe or deadly, regardless of if this is labelling mercury in computers, it doesn’t matter! People should have the right to know whats in their food!! The law requires food manufacturers to label nuts, milk, bread, etc, but somehow does not require a label for GMO. Again, it matters not the rhyme or reason that GMO is safe or bad, just why are they fighting so hard to stop labelling? It kind of spews that they are hiding something doesn’t it? If you got nothing to hide, who cares. Every dam thing in the world is labelled, cars, clothes, computers, bottled water, but why hide this?